In the days following the utter devastation Hurricane Maria caused in Puerto Rico, Nazarene churches there have mobilized to respond — in partnership with other Nazarene churches around the world. Last week, a planeload of humanitarian aid supplies left from Lenexa, Kansas, headed to Puerto Rico. Nazarene Compassionate Ministries partnered with Heart to Heart International, which was able to use its connections with FedEx to fly in the shipment. After the plane arrived in San Juan, contents were transferred to a large truck. A group of 30 volunteers from local Nazarene churches spent hours 2 October offloading the supplies, including water filters, thousands of Crisis Care Kits sent from many Nazarene churches, and 42,000 pounds of food packets donated through a partnership with Convoy of Hope, a faith-based nonprofit focused on feeding and disaster response. On Tuesday, more volunteers and pastors began the process of distributing the supplies to vulnerable families and individuals more than 10 communities. 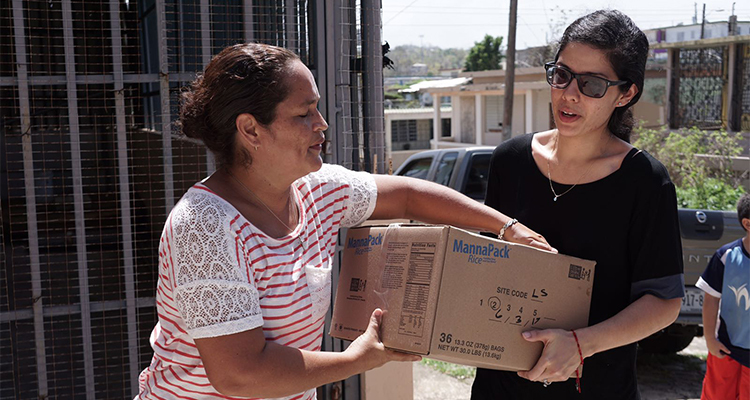 Volunteers from a Nazarene church in Dorado went to Naranjito, an impoverished mountain town where they regularly minister, to distribute food and care kits. The church in Vega Baja took food and CCKs to a home for senior adults that was lacking resources. Volunteers from a Nazarene church in Cataño distributed food and Crisis Care Kits in La Puntilla, an impoverished neighborhood that was flooded in great part by ocean water. As more supplies arrive, Nazarene churches are poised to continue to get aid to those in need. The Church of the Nazarene’s Southern Florida District arranged to deliver a cargo container of supplies, which is currently en route and scheduled to arrive in Puerto Rico by the weekend. The container includes more than a thousand Sawyer water filters, purchased with disaster response donations that have come to Nazarene Compassionate Ministries from churches and individuals around the world. Most of the island still has no access to potable water, making the water filters a critical need to prevent illness due to waterborne diseases. A Crisis Care Kit shipment was also sent to Puerto Rico through an unlikely source: the National Basketball Association's Dallas Mavericks. J. J. Barea, a point guard for the team who is from Puerto Rico, first took the team's private plane to Puerto Rico last week to bring his family to the U.S. This week he made a second trip with 600 CCKs from the West and North/East Texas Church of the Nazarene districts. “Barea loved the CCKs and took a box to show the leaders of his foundation as an example of a great idea to help,” said Chrissy Maldonado, a youth pastor from Arlington, Texas, First Church of the Nazarene, who helped load the kits. "The plane will be doing a second trip and they would like for us to bring the rest of our boxes to send again." Pastor Ron Adams of Ovilla Road Church of the Nazarene first came in contact with the team two years ago when a tornado destroyed his church while he was attending a Mavericks game. When he heard about Barea’s trip, he contacted the team to see if they had room for CCKs. Mavericks owner Mark Cuban made the trips possible. Heart to Heart is also slated to fly another shipment of supplies on behalf of Nazarene Compassionate Ministries 9 October. The planeload of aid will include generators, tarps, batteries, canned goods, diapers, baby food, and baby formula. The generators and batteries, in particular, will help provide for urgent needs. Officials estimate that it will take up to six months to restore power to the entire island. Nestor Hernandez grew up in Puerto Rico, where his father, Andres Hernandez, serves as district superintendent for country’s East District. Nestor, who serves as pastor of youth and community life in Melbourne, Florida, is currently in Puerto Rico helping coordinate shipments and disaster response efforts on behalf of Nazarene Compassionate Ministries. The situation in Puerto Rico is growing more concerning by the day. Most areas are without power, creating life-threatening situations for individuals who depend on power for medical treatments, as well as nursing home residents who are vulnerable to excessive heat. There is also a shortage of food and safe drinking water. While supplies are on the way, more help is greatly needed. Those who want to support disaster response efforts in Puerto Rico are encouraged to visit ncm.org/Maria. Please pray for those who are most vulnerable to the loss of power and shortage of food and safe water. Pray for families and individuals who are left to rebuild their lives, that resources would come. Pray for those grieving the loss of loved ones. Pray for those who are fearful, that they would experience the love and peace of Christ. Pray for safety for local church leaders and volunteers as they travel to distribute aid to those in need. To send a prayer or note of encouragement, go to ncm.org/pray. Travel is still limited, and churches are not yet able to receive volunteers. Anyone interested in volunteering once possibilities open up may fill out a volunteer information form at ncm.org/Maria. Churches and individuals around the world can provide support through the Emergency Relief Fund: Hurricane Maria. Donations will be used for emergency supplies as well as long-term recovery and rebuilding efforts.